Uncontrolled urban development and expansion of tourism-related facilities in and immediately surrounding the World Heritage areas. Following the request of the Bureau in November 2000, the President of ICOMOS carried out a Reactive Monitoring Mission to the Potala Palace and Jokhang Monastery between 26 February and 6 March 2001. The Urban Development Plan of Lhasa has considered the protection of the World Heritage areas. Weakness in co-ordination of activities in the past has resulted in inappropriate construction in the heritage areas. The authorities however stated that the problems have now been solved and that a system of clearance by the Administration of Cultural Heritage of Tibet Autonomous Region has been established. The mission noted a newly constructed television tower, which is located outside the buffer zone but interferes with some of the distant visual angles of the Potala Palace. Redevelopment of the lakes and parks to the South and the West of the Potala Palace that comes within the buffer zone has been integrated into the Lhasa City Development Plan providing a scenic surrounding to the Potala Palace and creating place for relaxation and enjoyment to the general public. In the protected area in front of the Potala Palace (Shol Area) within the World Heritage area, composed of a large number of historic buildings that historically served the integrated functions of the Potala, many incompatible additions and alterations have taken place in the past. This area, presently occupied by private institutions and persons, has been taken over by the Administration of Cultural Heritage under a special conservation project and they have started providing alternative accommodation to the present inhabitants prior to the conservation of the buildings. 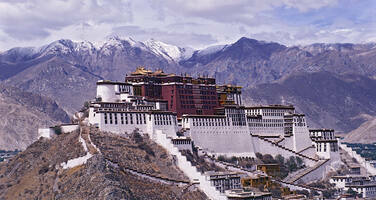 Plans have been made to accommodate only those activities deemed compatible with the functioning of the Potala Palace.. The Potala Palace Protection Plan and Jokhang Monastery Protection Plan were prepared, focussing attention on the conservation, maintenance and monitoring, including annual programmes to enhance religious activities, best utilization of the available staff and funding from various sources including income received from visitor fees . With regard to the general lighting and special flood lighting installed in the public piazza of Jokhang Monastery, the mission proposed improvements and modifications to the existing lighting system to the Mayor and the technical staff of the Lhasa Municipal Government. Regarding the large surface area of valuable murals painted on clay-lime plaster, the authorities have only taken preventive measures as they do not have trained personnel in Tibet for painting conservation work. The authorities requested ICOMOS Scientific Committee on Wall Paintings to propose a training activity for mural conservators in Tibet. No scientific documentation and conservation work is being planned for thousands of Thanka paintings drawn on silk some dating from the 11th century; nor the scripture books documenting Mahayana Buddhist doctrine, surviving from the 7th century, written in Sanskrit and Tibetan languages on palm leaves, bark sheets and Tibetan hand made paper. Poor management of documentation, termites, rats, humidity and fire have been identified as major threats to these valuable cultural property. With regard to international co-operation, the authorities indicated their wish to collaborate with international organizations in preserving the World Heritage areas, but reiterated the need for all international projects to be cleared by them and be integrated into the overall conservation plan. 3. The Secretariat was informed recently by various sources that some religious treasures at the Potala Palace are being exported, such as the five-metre bronze and gold statue of Maitriya - the future Buddha, from the tomb of the 7th Dalai Lama and statues and artifacts from another shrine in the Potala Palace to Shanghai. On 16 May 2001, the Secretariat requested the Chinese authorities to provide further information concerning the current policy regarding movable cultural heritage of the Potala Palace and Jokhang Temple in Lhasa. The Bureau expresses its appreciation to the Chinese authorities for facilitating the ICOMOS Reactive Monitoring Mission to the Potala Palace and Jokhang Temple in Lhasa. The Bureau recalls having encouraged the Chinese authorities to submit a training request for the organization of a training Workshop on the conservation of mural paintings with support from UNESCO and the Advisory Bodies. The Bureau also requests the Chinese authorities to provide further information concerning the current policy regarding movable cultural heritage of the Potala Palace and Jokhang Temple in Lhasa. Furthermore, the Bureau expresses its readiness to consider international assistance from the World Heritage Fund to support the national and local efforts in safeguarding the World Heritage areas of Lhasa and requests the World Heritage Centre to work in close collaboration with the State Party to prepare a plan of action to address the conservation issues raised in the Reactive Monitoring Mission Report of ICOMOS. As requested by the Bureau at its twenty-fifth session, the Secretariat continued to work in close collaboration with the State Administration of Cultural Heritage of China and the Government of the Tibetan Autonomous Region to prepare the organization of a Mural Painting Conservation Training Workshop at the Potala Palace World Heritage site. Within the context of the Regional Periodic Reporting Exercise, the Centre is closely co-operating with the State Party to elaborate a plan of action to enhance the conservation and management of the property. The Centre was informed by independent reports and the international press that there were plans to construct a 35-meter high monument within the World Heritage protected areas of the property. During a UNESCO mission to China in August 2001, the Deputy Director of the Centre consulted representatives from the Administration of Cultural Heritage of the Tibetan Autonomous Region and the State Administration of Cultural Heritage of China, who informed her that this plan had been abandoned. The Centre was informed that heavy rain in August 2001 caused the collapse of one of the main walls of the Potala Palace as well as other portions of the World Heritage protected areas. In co-operation with the relevant Chinese authorities, a WHC - China fact-finding mission is being organized to the property in early November 2001. The report on the state of conservation of the Potala Palace and Jokhang Temple in Lhasa will be presented to the Bureau at its twenty-fifth extraordinary session. V.227 The findings of the ICOMOS Mission undertaken to the Potala Palace and Jokhang Monastery (26 February - 6 March 2001) were examined by the Bureau, following its request for the mission at its twenty-fourth extraordinary session. The ICOMOS Mission had been undertaken in conjunction with the evaluation mission for the nomination of the extension of the site to include the Norbulingka Palace. V.228 The Bureau’s attention was drawn to the uncontrolled urban development and expansion of tourism related facilities which are reportedly continuing both within the World Heritage areas and in the immediate surroundings. The Bureau recalled that the protected area of Shöl is composed of a large number of historic buildings that serve to illustrate the once integrated functions of the Potala Palace and that many incompatible additions and alterations had taken place in different epochs of the recent past. The Bureau was informed that the Shöl area, occupied previously by private institutions and persons, is now administered by the Administration of Cultural Heritage of the Tibetan Autonomous Region (TAR) which has started providing alternative accommodation to the inhabitants prior to the rehabilitation of the buildings. V.229 Referring to the recent transportation of some 40 artifacts from the Potala Palace including a 3-metre bronze and gold statue of Maitriya, the Observer of China confirmed that these treasures were temporarily removed to be displayed at the exhibition "Cultural Treasures of Tibet" in Shanghai until 25 October 2001. Upon closure of this exhibition, these artifacts would be returned to the Potala Palace, following national policies pertaining to movable cultural heritage. V.230 In response to the concern expressed by international experts regarding the poor condition of the mural paintings of the Potala Palace, as well as insufficient storage facilities for the protection of the thousands of 7th century Mahayana Buddhist scriptures and 11th century Thanka silk paintings, the Bureau was informed by the Observer of China that the State Administration of Cultural Heritage of China would fully support the organization of a Mural Painting Conservation Training Workshop, subject to the formal request from the Government of the Tibetan Autonomous Region. V.231 The Bureau, expressed appreciation for the efforts made by the national and local authorities in elaborating the Potala Palace and Jokhang Monastery Protection Plans which focus on the conservation, maintenance and monitoring of the site, as well as on annual programmes to enhance religious activities, and on optimum utilization of available staff and funding from various sources including income received from visitor fees. V.232 The Bureau also thanked the Chinese authorities for facilitating the ICOMOS Monitoring Mission to the Potala Palace and Jokhang Temple in Lhasa. The Bureau, in noting its concern over the state of conservation of the various elements of this World Heritage site, reiterated its readiness to favourably consider an international assistance request from China for the organization of a Mural Paintings Conservation Training Workshop with support from UNESCO and the Advisory Bodies as well as other activities to support the national and local efforts in safeguarding the World Heritage areas of Lhasa. The Bureau requested the World Heritage Centre to work in close collaboration with the State Party to prepare a plan of action within the context of the Periodic Reporting exercise to address the conservation and management issues examined by the Bureau, and to report to the Bureau in due course. The Committee decided to approve the extension of the inscribed property, Potala Palace and the Jokhang Temple Monastery, Lhasa, to include the Norbulingka area, maintaining the existing criteria (i), (iv), and (vi). The Committee noted that, because of development pressures in the city of Lhasa, particular attention be given to the mitigation of the changes in the areas surrounding the World Heritage properties. The Bureau may wish to examine further information at the time of its session.